Pal Payasam is a classic dessert made with rice, milk and sugar. It is prepared on special occasions and festivals. It is rich, creamy and tastes heavenly. The good thing is this payasam is so simple to prepare. Even beginners can try this fool proof recipe with confidence. 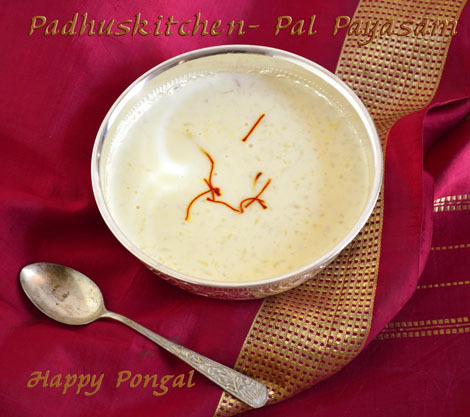 Today we will learn how to prepare Pal Payasam following our easy recipe with step wise pictures.This is Pongal Special from Padhuskitchen for you all. Heat a tsp of ghee and fry the basmati rice for a few minutes. Do not over fry until it turns brown. Then just dry grind it in the blender for a second or two. ( not more than that) The rice should be just broken and not powdered coarsely or finely. See picture below. Take a pressure cooker, grease the bottom with 1/2 tsp ghee. This is done to prevent the milk from getting burnt. Add 4 cups of boiled milk and ground rice to the boiled milk. Put a small plate or a spoon or a small vessel to prevent the milk from boiling over and spilling. I dropped a small plate inside the milk. Close the pressure cooker and keep the flame in low. Once steam starts coming, put the weight and keep it in very low flame. After the 1st whistle switch off. Open and see after the pressure subsides. If the milk has not thickened, boil for some more time in low flame. After 30 minutes (total time), my payasam looked thick and creamy as shown in the picture below. Now add sugar, mix well and boil for a few seconds until sugar dissolves. I added 1/4 cup of sugar as I do not like very sweet payasam. You can add sugar according to your taste. Then add saffron, cardamom powder and mix well. Serve hot or cold. It’s delicious either cold or hot. Note - You can use any heavy bottomed pan for preparing this payasam/kheer. I have used pressure cooker just to speed up the process and save time and energy. The whole process has to be done on low heat. It is that which makes the payasam delicious.You can use the special Kerala red rice also for making this payasam. This payasam does not need raisins or nuts as the taste and flavor of the milk itself is divine. What are you waiting for? Prepare this delicious kheer and win the heart of your loved ones. Are you searching for Kheer Recipes? Then search no more. Find a nice collection of payasam recipes in the link below. If you are searhing for Pongal recipes, then you have come to the right place. Find a list of recipes prepared for Pongal festival. Wishing all my reader who celebrate Pongal a Very Happy Pongal. Have a great time with your family and friends. Tomorrow is Hanuman Janthi.I am going try this payasam along with Urad dal vada :)very simple and useful one. What do you mean by this step especially - put the weight? Thank you for sharing it was easy and came out very well!!! Hi this looks yummy....can you share payasam recipe made using milkmaid available in the market..i got a tin but dont know how to use it..can I make kheer using that ? Pls help.. Thank you so much for your nice words. Regarding your doubt, you can use milkmaid. You can add after adding milk. Once the milk boils, reduce the heat and add the condensed milk and follow the same method. You can add condensed milk depending on the sweetness you need. If adding condensed milk, you can skip sugar. Hi mam thank you very much for this wonderful recipe. Planning to prepare this for pongal tomorrow. One small doubt. Can I prepare this payasam with again blue colour milk packet? I wish to try this recipe. I use an electric stove and the lowest setting on that might be too low to get a whistle. I was wondering if I could place the rice-milk mixture in a vessel and then pressure cook until 1 whistle in medium heat instead of low heat. Will cooking in a vessel alter the recipe in anyway? Like,should I pressure cook for more time/whistles ? You can try pressure cooking keeping it in a vessel inside the cooker and then transfer to a heavy bottomed vessel and slow cook. It is the slow cooking which gives the taste to the payasam. The payasam came out just like how the caterers serve in Kalyanam!! Using a cooker and allowing 1 whistle got the milk to thicken and giving the exact taste of condensed milk!! Thanks Padhu, I always treasured this payasam and I am so thrilled I am able to make it!!! I doubled the recipe ,came out very well! Thank you!